Fast-paced gaming, cool mechanics, easy to learn and a fun party game. No music during the main game, repetitive, not a lot of map variations, and an unresponsive menu. ARENA GODS has potential and they have a great combat system in place. 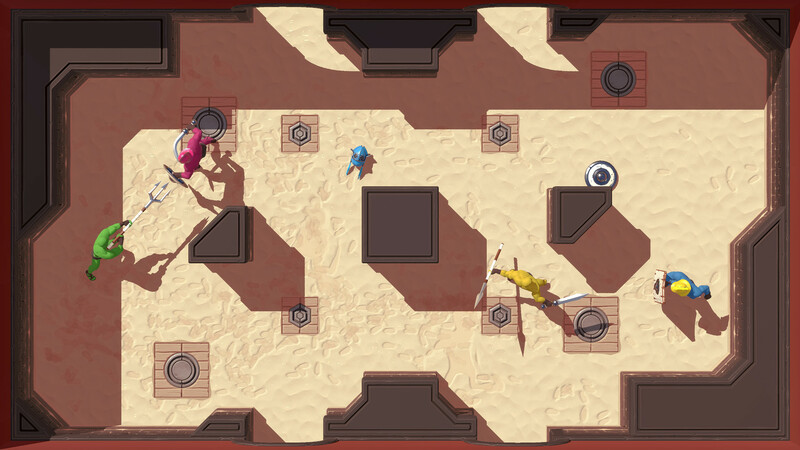 The fast-paced rounds are very fun and with four-players it allows for a lot of mischief. I wish they had multiple modes to try out, but they said they will add more when it comes out as well as new maps and weapons. Let it be known I am playing the early access version. At its current stage, which is a very limited early access, the game is not worth the asking price of $15. However, at around $5, the price would be just right. Once the game is completed and released with a full array of music, maps, modes and weapons, the current asking price will make sense, and will be worth the investment. The combat system is awesome: you control both your gladiator's left & right arms. You pick up either swords, spears, shields, helmets and/or other gladiator's limbs, all of which can be used as a weapon. Only the swords and spears can kill gladiators while they are standing; the other weapons knock them down and you can jump on them and use your fist, or the other blunt weapons to execute your enemies. Another great mechanic is the ability to throw whatever you are carrying, but beware that the enemy can catch whatever you throw if timed right. You can also evade attacks or throws. The edge of certain stages has doorways that lead to the opposite side of the map, which thrown items will go through and end up just looping until the item collides with a wall or gladiator. There was also a glitch that made the matches very fun: the game basically made it such that the arena had no walls and whenever a weapon was thrown it would go through the walls and would not collide with any wall it touched. The menu is very lackluster. There is a settings button, but it just gives you a message saying there are no settings until the full release. The menu is sometimes unresponsive when you use the controllers. Using a keyboard is a bad idea in my opinion as the keys you use are inconvenient to press. Sometimes the gladiator would not evade when you hit the evade button. After the matches, it gives you a scoreboard displaying your round wins, kills, deaths, suicides, catches and deflects. Also, after each match, if you still have four players, you can jump right back in with Rematch button. As mentioned in Graphics, the environment is just sand, brown walls and brown pillars in the middle. The environment plays a big part in fighting people: you must know where the open doors are to watch where the weapons can come from or where to throw the weapons through. Beware, though, as you can kill yourself if you are not paying attention. Use the environment to your advantage. The graphics weren't outstanding, but they weren't terrible. The character designs are standard: one-character model with different colors. The weapons look cool, nothing amazing or ugly. The stages are generic, just sand and brown walls. Cutting someone's limbs looks nice as well, not much detail when it happens. They have one song on the main menu, and it is catchy with a great beat. Unfortunately, this is where the music ends. The game would really benefit from adding music to the matches, when you're fighting with friends. I like the sound of weapons flying and colliding with other weapons or hitting someone, but I also would like music to go along with it, so you don't constantly hear weapons colliding. Four gladiators killing each other in awesome or silly ways is always a blast. This game supports local multiplayer like most party games. They do it well, though there is no variation of characters besides a different color and helmet for the gladiators. One second you will be yelling at your friend and the next you will be laughing with them. You will also think you're the best but then end up killing yourself, because your friend has adapted to you. There was one glitch where we started the game and a gladiator was not even controlled by the player, but instead was the controller by the game's AI. The character was fighting his controls, but we restarted the game and everything was back to normal.